Mary (Kerwin) Reihl – or “Mimi” as she was better known to her family and friends – was an early California female surfer. Born in 1912, Mary Kerwin was among the first generation of children from her family to be born and raised in Hermosa Beach. Her grand uncle, Bernard “Ben” Hiss, was an early real estate entrepreneur in the South Bay area, who was on the original Board of Trustees that was responsible for incorporation of the City of Hermosa Beach in 1907. Her father, John Kerwin, emigrated from Ireland in 1905. After meeting Mary Emma Hiss in Hermosa and then marrying her, he started the family bakery business in Hermosa Beach in 1910. Mary/Mimi was the second of nine children born at the family residence and bakery business on Pier Avenue, less than a half block from the beach. “You could spit out the window at the water, and that was our playground,” recalled Mimi’s brother Ted. She attended Ocean View School in Hermosa Beach, which was located at the crest of the sand dunes, near the current location of Saint Andrew’s Episcopal Church on Monterrey Boulevard. Although the little town of Hermosa Beach was growing rapidly at the time, the town center and surrounding residential area essentially consisted of an expanse of sand that was the landward extension of the adjoining beach area. With the ocean as a backyard, it was only natural that Mary and her siblings would get into the ocean. She was a natural athlete, and although she was generally the only female surfing her home break, she didn’t feel particularly special or unique because that was just one of the family activities when you lived at the beach. “We were born and raised with our feet in the ocean, all nine of us,” said Mimi’s sister Emma Halibrand. 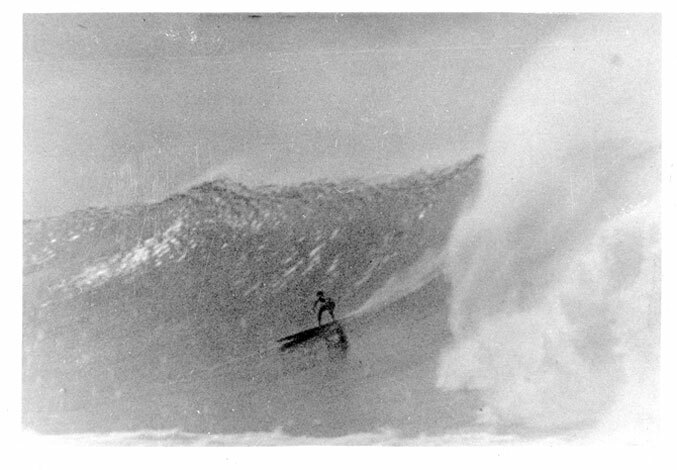 As kids, Ted Kerwin recalled, they rode waves on everything from belly boards made of scrap lumber to discarded wooden ironing boards before progressing to much larger and heavier paddleboards and solid-wood surfboards. Mary graduated from Redondo Union high School in 1931, and married Ward Reihl, a Southern California Gas Company employee, three years later at Saint James Church in Redondo Beach. In 1934, Mimi’s older brother John founded the Hermosa Beach Surfing Club, whose 14 original members included their brothers Joe, Jim, Fred and Ted. Mary, however, could not join. It was a strictly male organization, although she represented the club in contests. Mary, her sister Emma and a few of the other local ladies represented Hermosa Beach in the women’s division of the surfing and paddling competitions during the 1930s and early 1940s. Although Mary and Ward’s daughter, Joan, was born in 1936, Mary continued to represent Hermosa Beach, and won the prestigious Pacific Coast Surfing Championship that was held in Long Beach in 1939. Jim Kerwin still has the 12-foot, 65-pound paddleboard he made out of pine and quarter-inch plywood for Mimi in 1939. It’s the same board she used to win the Pacific Coast Surfing Championship in Long Beach. She also used it to compete in other contests, including the 1939 national paddleboard and surfing championship in Long Beach: She placed first in the women’s division for the quarter-mile national paddleboard championship, with a time of four minutes, 32 seconds. 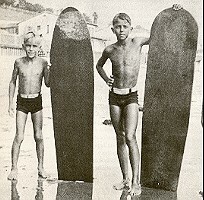 Mary’s second child, Robert, was born in 1941, shortly before the departure of most surfers, including her five brothers, to serve during World War II. With the attention of the country directed to the war, the surfing scene in Southern California had a general hiatus for several years. Although Mary’s affection and family ties to the beach continued, her children and family became her primary focus and her surfing career was relegated to a past of pleasant memories. Mary/Mimi continued to surf after her two children were born, but gave it up after World War II. Her nephew, Scott Kerwin, said that when quizzed about her early surfing days at family reunions, his aunt wasn’t much interested in the subject. “She was more interested in what was going on now than what was going on in the past,” he said. Mary remained a “kid at heart” throughout her long life, and is remembered as never being far from a good time, which combined to make her a favorite with the younger generations of her large family and extended family. Mary/Mimi Kerwin Riehl passed away at the age of 91, on March 16, 2004. Manhattan Beach local Dale Velzy joined the Merchant Marines. At one point, while stationed in Guam, Velzy scrounged up some plywood and built a hollow paddleboard/surfboard. He paddled and rode it in Guam, Malaysia and Australia. On one memorable night of darts, beer and Aussie “sheilas,” Velzy gave the board away. Matt Kivlin had just been introduced to surfing by the husband of his mom’s sister. Preston “Pete” Peterson introduced the 14 year-old from Santa Monica to the wonders of Malibu on July 2, 1944. In recalling his beginnings as a surfer and a shaper, Velzy said, “One of the first surfboards I ever used belonged to someone I didn’t even know. I found it sitting along the side of someone’s house on 6th Street in Hermosa Beach. I used it every day one summer, until my dad, who was a lifeguard at Hermosa, agreed to help me make my own board. 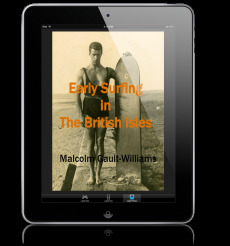 “We lived next door to Hoppy Swarts and Leroy Grannis, two surfers from the thirties. My dad made my first board off the design of their boards. I was eight or nine at the time. Not long after he’d made it, I ran into the pier on it and split it down the center. In those days, this would happen quite a bit. We’d just glue it back together, bolt it and put a cork in over the bolt. After you broke these boards a few times, they got a little waterlogged, so you’d have to bring them in and reshape them. That’s what got me started shaping and designing boards. I became real interested in design, in making the boards work better, according to a person’s weight and style. “Eventually, other guys started asking me to make changes to their boards. We didn’t have fiberglass then. We didn’t even varnish the boards. We’d get splinters, but we’d just take them out and keep surfing. It was a while before my dad would loan me his good tools to try my hand at shaping balsa wood. My best board was the second redwood I made for myself. I was in the Merchant Marines, and went off to the war in ‘44. I left my board with a friend, Ed Edgar, and told him that he was the only person who could ride it while I was gone. I came home to find out that someone had stolen the board. James, Surfing San Onofre to Point Dume, 1936-1942, ©1996, p. 136. Don James written caption to image on p. 94. James, Surfing San Onofre to Point Dume, 1936-1942, ©1996, p. 124. Don James written caption to image on p. 32. James, Surfing San Onofre to Point Dume, 1936-1942, ©1996, p. 131. Don James written caption to image on p. 69. James, Surfing San Onofre to Point Dume, 1936-1942, ©1996, p. 124. Don James written caption to image on p. 34. See also other images featuring Jack Quigg and contemporaries. James, Surfing San Onofre to Point Dume, 1936-1942, ©1996, p. 124. Don James written caption to image on p. 36. James, Surfing San Onofre to Point Dume, 1936-1942, ©1996, pp. 128-129. Don James written caption to image on p. 58. James, Surfing San Onofre to Point Dume, 1936-1942, ©1996, p. 125. Don James written caption to image on p. 39. Grissim, John. Pure Stoke, ©1982, Harper and Row, New York, p. 20. Dave Rochlen quoted. Young, 1983, 1987, p. 73. Lueras, 1984, p. 111. Joe Quigg. Stecyk, “Humaliwu,” 1992, p. 36. Surfer, Volume 33, Number 12. Researched by C.R. Stecyk, p. 40. Noll, Greg and Gabbard, Andrea. DA BULL: Life Over the Edge, by Greg Noll and Andrea Gabbard, © 1989. North Atlantic Books, Berkeley, California. Dale Velzy’s recollections, pp. 25-26.